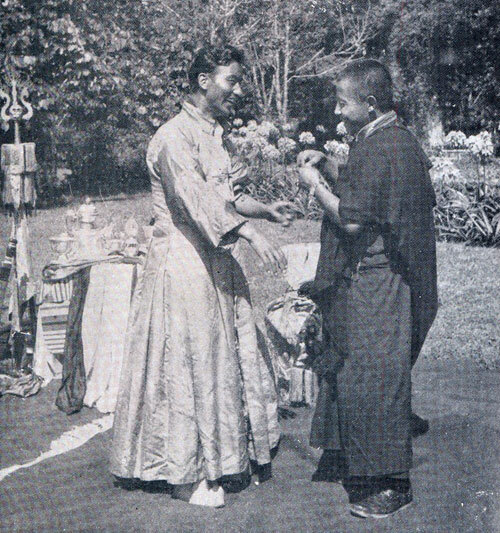 Geshe-la did give special treatment to his oracle uncle. Geshe-la invited his uncle the oracle several times to UK. In fact his oracle uncle took trance of Dulzin for over three hours and GAVE INITIATION OF AVALOKITESVARA to the students there one one occasion. That is how much the power of the oracle was revered before in NKT. Many trances were taken and Geshe-la privately consulted Dorje Shugden on many issues re himself, his deceased mother, the organization on the whole. So there is nothing weird about the whole oracle practice. Some of the greats like Pabongka, Trijang and Zong Rinpoches consulted oracles their whole lives and taught lojong/realized lojong also in their mindstreams. So part of what they do is great and part is weird? I don’t think so. We accept what we don’t understand about our lamas and refrain from labelling would be better conduct. It was a rare occasion, when Dulzin took trance and gave initiation in Geshe-la’s centre. The Oracle Uncle was very respected, was given a seat of honour in the pujas there, many students came to receive his blessings when he was not in trance also. This all stopped when Geshe-la and his uncle has a huge fall out and NEVER SPOKE AGAIN UNTIL THE ORACLE’S DEATH A FEW YEARS BACK. So Geshe-la had a personal fall out with his Oracle Uncle and it all came to an end. Yes policies change and Geshe-la changes his mind. But it also means he can make mistakes (sorry). Geshe-la’s policies are GOOD FOR NKT AND THEIR MEMBERS, but his policies should not be seen as overview rule of thumb for all Tibetan Traditions around the world and their centres for example tulkus and oracles. NKT doesn’t ‘accept’ does not mean it is weird, wrong, or not applicable in thousands of other places. I have had EXCELLET EXPERIENCES WITH ORACLES AND TULKUS IN MY LIFETIME AS SCORES OF MY FRIENDS also. And we love lojong, lam rim, and it’s practices as these are our main practices always. Geshe-la very much agreed with oracles and their usage, until his personal fallout with his uncle. That is a fact. Then his policies with oracles in NKT changed. But we don’t have to change our ‘policies’ regarding them and no one should berate us for it also. No one has the right. Geshe-la / NKT received huge negative media and backlash because of the ’1st wave’ of protests organized by Geshe-la against the Dalai Lama. Some of his key supporters felt the backlash, spoke up and some left. Geshe-la realized it was a mistake to protest so openly saying it is from him. He made a mistake. His policies changed. Next time around, it was the WSS with him supporting them from behind and ‘not’ NKT that organized the huge wave of protests. Don’t get me wrong, I feel Geshe-la is courageous. I prayed for him and his long life. I still do. My point is policies he makes can be changed according to student’s aptitude, place, time and also mistakes. THAT IS OK. But just because NKT’s policies do not give a ‘special bus seat’ to oracles and tulkus does not mean their policies are correct for everyone. Or these institutions should be ‘disparaged’, ‘ridiculed’ or spoken against in the thousands of other places they have positive effects and benefits. Also for hundreds of years in some cases. Geshe-la can make mistakes, but it does not mean he is not a authentic practitioner of sutra/tantra and very qualified to teach. He is very qualified. But his personal disagreemants with oracles does not set the plateau for everyone. Nor should his students comment negatively to non-NKT students who accept oracles and tulkus. The backlash against Geshe-la/NKT was huge, but the protests brought attention to our cause onto the world stage. It gave a voice to where none would be heard. How compassionate of Geshe-la and courageous. How devoted and strong of his students that participated. I respect them very much on the whole as well as many dorje shugden lamas, centres and students around the world. With folded hands to Geshe-la and NKT deeply. Dromo Geshes ( a great tulku on his ’3rd’ incarnation hasn’t ‘messed’ up yet) always had great oracles in his monasteries. His last oracle Lhakpa Dondrub) passed away a few years back. Dromo Geshe had special chapel, thrones and places in his monasteries for his dorje shugden oracles. The last one was a layman also! Trijang Rinpoche blessed, consecrated, oversaw the training of Choyang Dulzin Kuten (Geshe-la’s Uncle) and then authorized him as genuine when training completed. Zong Rinpoche consulted the oracle for most important issues until his last days and lived next door to the oracle in Gaden. Zong Rinpoche had a special oracle house and temple (Trokhang Dechen Chok) built for Dorje Shugden in Gaden. It has a special throne for the oracle to sit on in order to take trance right at the centre of the main shrine. This place exists today still. All of Gaden Shartse’s abbots, ex abbots, tulkus, Geshes, and sangha would have yearly audience on the Tibetan 1st month and 3rd day of New Year’s (losar). The whole sangha would be blessed by both Shugden and then Setrap entering Choyang Dulzin Kuten in the main prayer hall of Shartse. Yes the whole sangha. Also countless lamas, representatives from Gaden Jangtze, Drepung and laity would jam the prayer hall yearly in Shartse for their blessings and pronouncements. Gaden Jangtse’s administrators would ask questions of Shugden during trance for the welfare of the whole Gaden Jangtze institution. The same in Sera boompra khangtsen with their Shugden oracle, where Kache Marpo takes trance. All has stopped because of the ban. Both Gaden and Sera oracles were put into retreat for more than five years intense, examined, blessed and authorized by His Holiness Kyabje Trijang Dorje Chang in the end. The current oracle of Gaden is a student of the previoius Zong Rinpoche, and Zong Rinpoche mentioned years ago that he would be an oracle. So if Geshe-la does not find them fitting for NKT, or his students find it weird, Gaden, Sera and Drepung did not. To each his own. Many Geshes, teachers, Lamas consult the Gameng Choyang Kuten in US and Sera Oracle (authorized by Trijang Rinpoche, and this oracle’s father was also an oracle of Shugden) residing in Taiwan. They derive many benefits again and again. All of Shar Gaden Monastery invited the Gameng Choyang Kuten for their grand opening and had Dulzin peaceful/wrathful both take trance, bless the premises, answer questions and give prophecies to their successful survival. When Geshe-la passes away (very sorry to mention this), what happens to his incarnation? If recognized? Not recognized is fine also. But Geshe-la recognized his own mother’s incarnation and makes sure she grows up to practice dharma again. No special seats, but why recognize her at all then. Just recognizing her is saying alot already. Thai bus company will not give a special seat to the oracle on their buses but will give to monks, and that is true. But only to their monks. They do not recognize monks of the Tibetan Tradition. They do not feel it is a valid monkhood. So in Thailand, monks of the Tibetan tradition gets no discounts, no special seating (airplanes, taxis,etc), no religious priviledges their own monks receive. So their example is not applicable here at all. Believing, propitiating or trusting oracles and tulkus DOES NOT MEAN THAT IS THE MAIN FOCUS OR PRACTICE EVER. The main practice would be all the teachings on MIND TRANSFORMATION coupled with annurtara tantra of generation and completion stages for sure. That is the real protection from everything in samsara. But along the way, why not alittle help from our friends via the oracle. (The photo below is of the famous and very beneficial oracle of Dromo Geshe’s who resided in Kalimpong but now passed away. He was very clear and concise with his predictions and very loved by Dromo Geshe and many great lamas/laity who consulted him. The oracle’s name is Lhakpa Dondrub. He was a nice man also. I met and stayed with him. He would go into hundreds of trances per year and help so many. Unbelievable. But he himself was very devoted to Tsongkapa, Dromo Geshe, his practices and lived modestly. Dromo Geshe was very realized and he had the oracles in his monasteries to help the countless that were not when Shugden entered them to speak. Amazing, skilfull, multi-faceted actions by attained minds. Many methods to benefit those who have desperate situations and lojong has not been actualized in their minds yet. May the oracle system live long and continue. May Dorje Shugden continue choosing his oracles as he has for 350 years. Gameng Choyang Kuten didn’t officiate the opening of Shar Gaden. But Dorje Shugden himself officiated by taking trance of Gameng, and officiated with a Wisdom Dance, acceptance of offerings and advice/prophecies. Just think of how many Lojong-Lam Rim-Annuttara-tantra-loving sangha were there witnessing this great event and feeling blessed to be in Dorje Shugden’s presence via Gameng. Giving them hope, anwering questions, giving direction when they are so isolated and surpressed not like our beloved dharma brothers/sisters who practice freely in democratic countries around the world. The videos of this are on the homepage of this website of the event. I have watched the videos of Dorje Shugden take trance hundreds of times. I have downloaded onto my phone and watch when travelling. Like those monks, it gives me great hope. If Trijang Rinpoche/Zong Rinpoche/Dromo Geshe Rinpoche attained Lam Rim in their mindstreams and ‘rely’ on oracles (at least for us), then a nobody like me will follow their footsteps. Or at least not berate what I don’t understand yet fully. Just keep a respectful silence while absorbing and learning. Shugden in oracles will not liberate us from samsara, but can sure help while I am stuck here and not actualized realizations yet. The abbot, ex abbots, lamas, sangha can accept the oracle. They are the lineage holders of all that we hold dear. HH Gaden Trisur Rinpoche fully accepts the oracle and Shugden’s trance according to his assistants in Shar Gaden. So when it comes to Lam Rim, Panchen Sonam Drakpa’s commentaries, the commentaries of the 6 Ornaments and Two Supremes, Madhyamika, Heruka, Yamantaka, Guhyasamaja, and thousands of hours of debate, these sangha we can rely on and trust and follow. We praise them, prostrate to them, and take refuge, but when it comes to oracles, they are weird?? They are illogical or it’s wrong? NKT policies should be applied to them? I don’t think so. Again, these traditions are not arbitrary nor started for negative reasons. They have their valid function and purpose backed up by 1,000 years of rich Buddhist traditions. Hence we should think, it may not be in our culture, well neither is momos/tibetan tea/tsampa, but so what? It could be fine. Never look through the lens of our culture/upbringing/familiarity to ‘judge’ another’s. It is baseless and dual. So the oracle tradition is not weird but a sacred, majestic, rich living legacy of Buddhism & its illustrious Masters from the land of the snows and now to the world. 1. 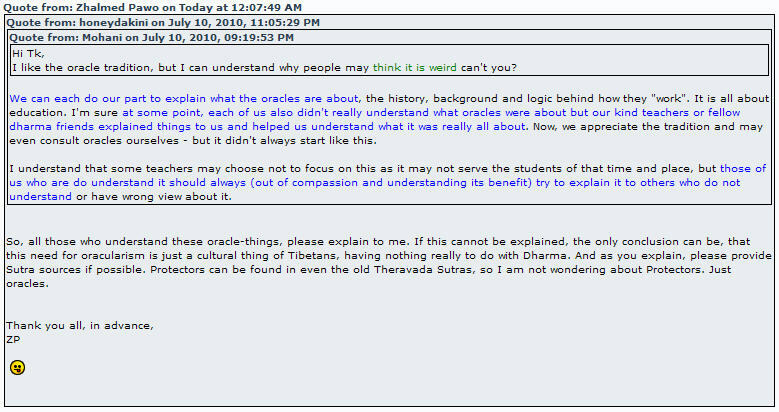 Of course the ‘oracle-things’ can be explained. If this cannot be explained, the only conclusion IS NOT “THAT IT IS A CULTURAL THING OF TIBETANS and HAS NOTHING TO DO WITH DHARMA”. TRIJANG RINPOCHE AND ZONG RINPOCHE CONSULTED ORACLES ALWAYS AND EVERYTHING THEY DID WAS DHARMA FROM BEGINNING TO END. EVEN BREATHING FOR THEM WAS DHARMA. SO IF YOU DOUBT THAT, YOU HAVE TO DOUBT OUR WHOLE LINEAGE. Do you think Trijang/Zong Rinpoche will engage in activities that have no meaning and no relations to dharma? I DON’T THINK SO EVER. NO DEBATE. It is your particular like and dislike due to ignorance perhaps that you have distorted thinking of certain very beneficial practices such as oracles or oracular practices. The oracles can be very useful. Western society relied on oracles and the like before the advent of Christianity. With Christianity, many practices such as the arts of divining, tarot cards, taking trances, reading the future, ouija boards all became labelled as evil and should be violently stopped. Violent and aggressive campaigns were set throughout Europe and the Americas to abolish these practices. We are the modern day results of that destruction in excluding anything labelled magical. Hence things like oracles are seen as superstitious, or invalid. That is the legacy of the advent of Christianity. The Delphic oracles with their famous Pythias were sought over the ancient world for their very clear prophecies for hundred of years. Destroyed by Alexander so he can be assured no one else will know what was told to him. How selfish. In order to assure his victory. 2. It would take many pages and hours to type out what I have learned at the feets of 8 eminent lamas for the last decades to explain. I will condense very short. If you understand, fine. If you don’t it’s obvious then why you’re ‘against’ it. 3. I would recommend to you to read ‘Wheel of Protection’ from ‘Exile From the Land of Snows’ to get an overview of how oracles work. Dorje Shugden and Nechung oracles operate somewhat differently, but generally same. Please do your homework, read, research, contemplate then speak to elucidate to others to clear their misunderstandings and ignorance. After all dharma is the highest form of giving. Before giving go get it. 4. Simple story: When I was in Dharamsala 14 years back, an American backpacker lady fell off the hills there and was lost for around two days. Her friends, local police, and some Tibetans scoured lower upper dharamsala for her. Could not be found. I went to see the Yudroma oracle for my personal reasons as were a few other people for their questions also. At that time, another group had consulted her out of desperation. The American friends were very desperate. The lady oracle went into trance with the help of the monk from Gyuto Tantric College as Gyuto Tantric College often consult her( Yudroma is their protective deity). Yes the renowned Gelug Tantric college goes to her to consult often. When Yudroma entered the oracle ( i witnessed several times), she gave the location, place and fall clearly. She also said the lady is still alive but must get to her quickly. Within another half a day, following her instructions they found the backpacker who had broken a leg ( maybe wrist) and was stuck in a precarious location. The Americans were dumbfounded. That was one of my first personal experiences with a recognized oracle with many more to come. Observed I did and convinced I am today. 5. Our bodies are just a shell in which our sublte consciousness temporarily abides. You can leave it and enter at will if you have practiced correctly. Ra Lotsawa and son were well known for that. Hence, since it is a shell, any beings can enter and abide including yourself. Thererfore possessions of the evil nature is definitely possible as the Vajra Yogini Kakkoo (ritual) text is a remedy for that. Possessions, ghosts, spirits, psychics, clairvoyants do exist previously and currently. The stories abound in the bios of Heruka lineage Mahasiddhas. We can temporarily abide elsewhere or within an object and let a higher force use our bodies to speak, express, move or do whatever actions that are necessary. Hence Dorje Shugden and Kache Marpo can definitely enter such a ‘ready’ body. When we do the invitations for example in Lama Chopa and ask the deities to abide, it can be inviting them to enter a statue or thangka we are consecrating. They abide at our request to become a merit field not that they have nowhere to go. Hence if they can enter a statue and abide, why not a human? Both are made of the four physical composite elements suitable for a consciousness to abide in. Of course there’s the formless also, but need not apply here for now. In the Tara ritual, you ask Tara to come forth, abide in her image. Then we make offerings, requests, mantras, prayers, etc and at the end, you ask her to remain in this image by scattering dried rice/flowers with appropriate recitation. Then she abides. When you invite Dorje Shugden to enter an oracle, you recite the invitational liturgy at the beginning of our Dorje Shugden Kangsol. If you wish the peaceful to come, the oracle will wear monk robes, yellow chogo/Namjar, and Pandit’s hat. Then Dorje Shugden will enter in a peaceful form to talk, known as Dulzin. If wrathful is required, then oracle will wear the full robes with flags, boots, weapons, etc. This energy cannot stay long, or talk much as it is in fierce form. Old oracles in their 70′s who limp or are on walking sticks when taking trance of the wrathful form, can leap, bend swords, ‘dance’ and whole body convulses with the energy of the deity-Shugden. That is amazing, what is more is, someone like Kuten Lama (Geshe-la’s uncle) never studied much, but in trance as Dulzin he can give long (2-3 hours) discourses citing perfectly from Panchen Sonam Drakpa, Nagarjuna, Chandrakirti, Dharmakirti, etc’s texts and give you page numbers and cross reference points. He can give oral transmissions, initiations, compose texts on the spot as I have witnessed. He is elucidating among scholars, high incarnates such as Zong Rinpoche, Zemey Rinpoche, Dagom Rinpoche, the abbots, Geshes etc. He can refute with them or even debate if the occasion calls for it. Out of trance, Kuten Lama is a nice old man whose knowledge of dharma is that of little higher than the typical Tibetan laity. Certainly he couldn’t fool the masters in Gaden for 30 years. He must have gone into trance thousands of times since Buxa when he was officially approved as genuine by H.H. Trijang Dorje Chang. Leaping around and bending swords is neat, but lesser spirits can also do the same. What is amazing and convincing is what comes out of the mouth of the oracle time and time tested again. Even things you asked Dorje Shugden through another oracle ten years back, when taking trance of a ‘new’ oracle he can recount and remind you. It has happened to me. I consulted Shugden through Sera’s oracle, then much later the Gaden oracle. While in trance Dorje Shugden reminded me of what he said precisely and accurately what he told me ten years back through a completely different person, different setting, different translators, different monastery. Mind you, what he told me was very intimate and very applicable to me. He has even indicated clearly to me what my gurus have told me in private- he reminded me of their vajra commands. This happened to me. I do not need you or anyone else’s confirmation as the advice was timely, very helpful and I saw the results. His advices and dharma talks will blow your mind. You feel you are in the presence of someone very old, grand and from another time. But then that cannot be used here, as that is subjective-my feelings of him that it. 6. Lama Tsongkapa’s Guru Yoga practice and Guru Rinpoche’s practice are not in the sutras or tantras from India. They were not taught in Pre-Tibet-Buddhist India. Due to the many enlightened activities of enlightened beings after the Buddha, of course that is possible. Buddha Shakyamuni cannot be the only enlightened one, otherwise the dharma is false. But by seeing the many attainments gained by many practitioners over 600 hundred years, we know Guru Yoga of Tsongkapa is valid. The close lineage of the Mahamudra instructions that are practiced by Tsongkapa’s disciples are also not the sutras and tantras of Buddha Shakyamuni/Vajradhara. Nyingmas rely heavily on Secret treasure texts or Termas never spoken about and guru Rinpoche’s mantra is nowhere to be found in the original sutras and tantras yet has created many realized beings within the Nyingma, Kagyu and Sakyas. Yet Guru Rinpoche’s initiation, practices, rites, rituals, images form the central core of the Nyingma lineage. Tsongkapa’s Guru Yoga practice was revealed by Manjushri directly to Tsongkapa. Hence if something is not in the sutras do not disqualify their authenticity nor benefits. In this case the qualifications of the author is very important. Thai Buddhists do not recognize Yamantaka, Heruka nor Vajra Yogini. They do not have the lineage nor believe that it originated from the perfect Buddha. Not finding something somewhere can lead to endless unnecessary debates. Hence, for us the author is very important. Dorje Shugden is not mentioned in the sutras. Dakpo Rinpoche named the ‘village lama’ by the 13th Dalai Lama ‘left’ his body and transported to Tushita to receive the practice of Dorje Shugden. So today if someone was to say that was their soure of teachings, this forum would be alive with snide sarcastic posts. So why is it we can believe Dakpo Rinpoche. Just because it happened 50, 100, 200 or whatever years ago? If we don’t believe him, then our whole Dorje Shugden lineage is a lie. Then why are we even here. The origins of our Dorje Shugden practice, Heruka, Vajra Yogini, etc are all from ‘magical’ beginnings. Yet we believe and trust. Why not oracles? Why not Shugden entering a qualified oracle consecrated and authenticized by HH kyabje Trijang Dorje Chang the heart son of Pabongka who in turn is the heart son of Dakpo Rinpoche? Contemplate. Not everything has to be in the sutras yet we still need a lineage no matter how magical it’s origins. Western culture claims to not accept anything magical but more practical. Hogwash. Much of western religions and our Buddhism is awash with ‘magical, mystical and obscure’ beginnings yet we still practice and proclaim logic. Logic by us is very limited. We cannot take full refuge in our logic after certain point. Heruka revealed his tantra by teaching on Mt Kailash to Vajra Yogini then to human first. How to verify that? Yet many have received attainments from Her practice. So we need to see results to ascertain validity of origins in this case. Many have received benefits from Dorje Shugden’s oracles for the last 350 years including myself many times over. How many scholars and masters rely on Asanga’s ‘Ornament of Clear Realizations’ given to him by Maitreya Buddha in Tushita. Doesn’t that sound wierd in today’s terms? How about if I wrote a text and told you Tara told me the contents. It would be psychiatric time. Well why do we accept Asanga’s assertions coming from such a source? Because we rely on the author and mostly the benefits in this case. Nagarjuna retrieved how many wisdom texts from the Nagas hidden away? Show me a naga. Have you seen one? Hence validity in Tibetan Buddhism is not stemmed only from the original sutras alone. There will be more teachings arising in the future logically speaking to suit the various aptitudes. Lam Rim made it’s first appearance by Atisha’s composition. Before that it was unheard of. Yet it is our core practice now having been passed down and further versions written of course the latest by Pabongka. Oracular practices do not need to be in the original sutras/tantras to validate their authenticity and applicability for dharma practitioners of this age, time and circumstances. I hope this sincerely help you. I have spent over 6 solid hours writing the various explanations on this thread. I didn’t write to convince you but to open your mind to things that perhaps are very foreign and at first unacceptable to you. I hope you will investigate further as knowledge is knowledge. We carry that into our future lives. As Shantideva says, there’s no limit to our minds ability to comprehend. I wish you luck and I humbly hope you will accept for others’ sake, if not your own, practices that may benefit them by not discarding due to ignorance. All practices by our lineage lamas should be respected and feel how fortunate we are to even hear about them. Our lineage lamas are free of faults, hence their practices, teachings, traditions, manners should be respected even if some cannot be applied now due to degenerate times, but they should not be seen as something Tibetan and hence culturally beneficial only. This entry was posted on Sunday, February 19th, 2012 at 12:38 am	and is filed under Articles. You can follow any responses to this entry through the RSS 2.0 feed. You can leave a response, or trackback from your own site. THAT WAS SUPER FAST!! I JUST POSTED AROUND HALF HOUR AGO. YOU GUYS ARE REALLY ALERT. I’M HUMBLED YOU PUT MY WRITE UP HERE. I HOPE IT CAN BENEFIT MANY. 1. It is clear and evident that oracles and so forth have also been used for politics and worldly achievements. This is a fact. 2. Such situation has contributed for Dharma practice to degenerate in those cases. 3. The Guide’s aim is to prevent the Dharma practice in NKT’s Dharma Centres to degenerate by using oracles and so forth for such purposes. Therefore, I think Geshe-la’s advise is correct. It is NOT mistaken. 4. In this degenerated times, in particular in the West, our predominant tendency is to pursue worldly attainments only… therefore, any practical advise that helps us to prevent our Dharma practice to degenerate is indispensable, essential or absolutely necessary. Therefore, I think Geshe-la’s advise is indispensable for his disciples. Other matters such as clairvoyance, miracle powers, wisdom and commitments beings, oracles, etc. are covered in Geshe-la’s Dharma books. My guess is that oracles might be valid but the point in Geshe-la’s advise is to address what is best for his disciples’ Dharma practice at this point in time. Finally, how the relationship with his uncle evolved… perhaps they are the only ones that know what actually happened and would remain a family matter, between them. I respect this. I hope these comments contribute to meaningful debates that increase our faith in our Guru and Three Jewels. IE’s sharing on NKT’s policies in respect of oracle certainly helps to clear the air. Another reason could be as GKG has made a complete break from the Tibetan Buddhist establishments, when GKG passes on there might not be any available support from Tibetan monasteries to ensure pure practice of oracle is being carried out in NKT. Thus to avoid abuse, it’s best to rely totally on the precious texts composed by the venerable GKG. A friend from NKT had shared that GKG even instructed his close students not bother to look for his next incarnation when he passed on as the Tulku system is alien to the Western Buddhists. Apparently, GKG told his students that it’s best to leave it to his next incarnation to find his own way back to the Buddhist community and prove himself based on his own spiritual attainments. Speaking to a few people who were close to Geshe Kelsang at these times, they have said that it was Geshe-las students who invited Kuten Lama over to England, just as they did with a few other Lamas. I heard a story about some people talking in the Kitchen at Manjushri Centre, saying that maybe they should ask Kuten Lama to teach on relying upon a Spiritual Guide, one of the Nuns turned around and said that maybe they should ask their spiritual guide. The person who told me this said that people were getting quite into asking Kuten Lama about things and not relying upon their spritual guide. Also my understanding is that the sittuation for Kuten Lama in india was getting increasingly dangerous due to his association with Geshe Kelsang, hence the fact that his ties with the NKT were cut, and this is probably why the story back at the tibetan settlements is that Geshe Kelsang and Kuten Lama had a fall out. Geshe Kelsang did have a fall out with his Uncle Kuten Lama. As Geshe Kelsang had a fallout with Lama Yeshe many decades ago and hence they split although Lama Yeshe is the one who invited Geshe Kelsang originally. The fallout was concerning Geshe Kelsang openly criticizing the Dalai Lama which Kuten Lama did not agree. Kuten Lama advised Geshe Kelsang to respect Dalai Lama or it can incur much negative press for NKT. Geshe Kelsang didn’t agree. Kuten Lama was extremely upset and did not want to speak to Geshe Kelsang anymore nor travel to England. Hence they never spoke again nor wrote. This was Kuten Lama’s own account. The fall out between the uncle and nephew is a family matter. But it was not kept in the family. But when so many have relationships with both uncle and nephew, it affected many. People would like to understand what happened for perhaps closure.